Okay, so the Periodic Table of the Elements is one of the iconic symbols of Chemistry. Even if you flunked your high school Chem, you’ll recognize it instantly. Unfortunately, if you flunked high school Chem, you won’t actually know what it means. Not recognizing that it’s a systematic arrangement of all the chemical elements, elucidating their properties in terms of their electron structure, you’re tempted to fill it in instead with items from whatever interest you do have. Make a Periodic Table of Fruit, or a Periodic Table of Government, or a Periodic Table of Rhetoric, then feel like you’ve somehow contributed something useful to Fruit classification. But what does this non-Elemental table mean? Do the properties of fruit recur periodically as something corresponding to atomic number increases? What even corresponds to atomic number? Why should fruit group as if it had electron shells? Does your table actually explain anything? Or are you just capitalizing on the fact that atoms do have electron shells and so elemental properties do arrange into a periodic table which is tremendously useful for chemistry, and applying it to something completely inappropriate? If you try and find out how you compute the distance between points on a sphere, you’ll get a bunch of sites which offer to calculate it for you if you enter the coordinates. If you search harder, you can even get the formula. But no one seems to be offering a derivation. So here you go. Consider A and B to be our two points we want to get the distance between, with latitudes φA and φB, and longitudes which differ by Θ. We’ll operate mostly on the disk formed by the parallel through B. The point where it intersects the pole is D, and the projection of A onto it is C. Let EB be perpendicular to DC. 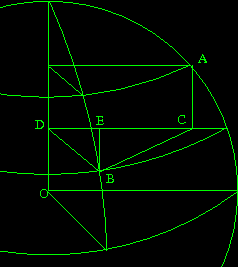 The radius of the parallel through A is cos φA = DC; the one through B is cos φB = DB. Angle CDB is Θ, so EB = rB sin Θ and ED = rB cos Θ.
EC = CD – ED = rA – rB cos Θ.
BC² = EC² – EB² = rA² – 2 rA rB cos Θ + rB² cos² Θ + rB² sin² Θ = rA² + rB² – 2 rA rB cos Θ.
AC = |sin φA – sin φB|. = 2 – 2 rA rB cos Θ – 2 sin φA sin φB. AB² = 4 sin² ½ψ = 2 – 2 cos ψ. So, 1 – rA rB cos Θ – sin φA sin φB = 1 – cos ψ.
ψ = arccos(cos φA cos φB cos Θ + sin φA sin φB). Randall Munroe, of xkcd fame, has gone and translated George Washington’s farewell address into everyday speech. It’s an utterly fascinating read, and much more tractable than trying to read the whole thing (it’s quite long) in his original text. Washington’s ideas on what makes good government are well argued by him, and Munroe has made it accessable. Give it a read, you won’t regret it! There’s other good informative bio videos there, but nothing else with as tasty eye-candy.